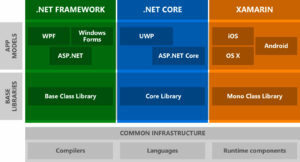 In the above image (click to enlarge), you can see that each of the major platforms within the .NET ecosystem have their own Base Class Libraries (BCLs). Each of these platforms uses it’s BCL to communicate with the Common Infrastructure’s APIs. This means that any change made to .NET Framework’s BCL (to implement a newly added feature in the Common Infrastructure, for instance) would have to be replicated across to the BCLs for both .NET Core and Xamarin to keep them all synchronised and offer whatever new feature necessitated the change to .NET Framework. The main issue here is that supporting three separate libraries (in this example, but many more as the .NET ecosystem evolves) is a non-trivial issue. Especially since Microsoft are looking to push .NET to a whole host over other platforms (including more Linux distributions, and even IoT devices). Not only is supporting three separate BCLs a big task (what with Microsoft adding new things to .NET Core constantly and merging them back to .NET Framework and Xamarin where applicable, and vice versa), but what if someone wants to port .NET to a new Operating System? Well, they’d have to implement their own BCL and ensure that it communicates with the Common Infrastructure correctly. Which would be yet another BCL for the community to keep in sync. Hopefully, you’re starting to see why this is a problem. This had lead to a situation where developers are having to use conditional compilation on their projects in order to ensure that the libraries they are using provide a minimum selection of BCL APIs – selecting different libraries for different target platforms. And sometimes this is done by the libraries themselves, behind the scenes. 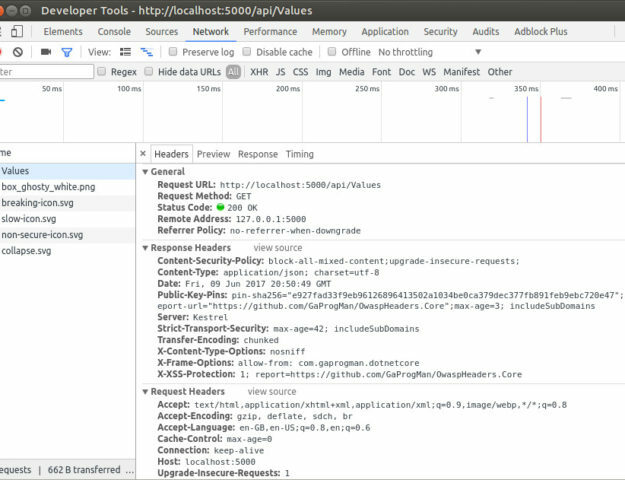 It also means that Portable Class Libraries are no longer that portable, since developers who are creating them cannot guarantee that all of the required BCL APIs were available on the target platform. This is where the .NET Standard comes in. The .NET Standard is Microsoft’s attempt at standardising how the cross platform .NET APIs will work across all supported .NET platforms. Including IoT and RaspberryPi support, which is coming soon (at the time of writing). As you can see, the goal here is to create a single BCL for all .NET ecosystem platforms to use. This will remove the issues created by having separate BCLs across each platform. I’m not going to go into the history of the .NET Framework, but you can read a little about it here if you wish. That’s a link to a blog post which I wrote for the company I work for. The .NET Framework has been around since 2002, so the entire thing is quite well documented. The biggest issue facing the .NET foundation is that there are versions of the .NET Framework and of the Xamarin stack which implement different features of the Common Infrastructure. Let’s not mention .NET Core just yet. So, how do you know which version of what is supported? 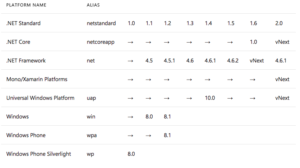 Well, the idea is the different platforms within the .NET ecosystem will be ratified against versions of the .NET Standard as features are added to those platforms. This image is correct at the time of writing this blog post. This means that a developer will be able to choose from a range of ecosystem platforms which support the features that their projects require, by checking which version of the .NET Standard those platforms support. Which, in turn, will increase the developer’s choices for target platforms as the .NET Standard evolves. 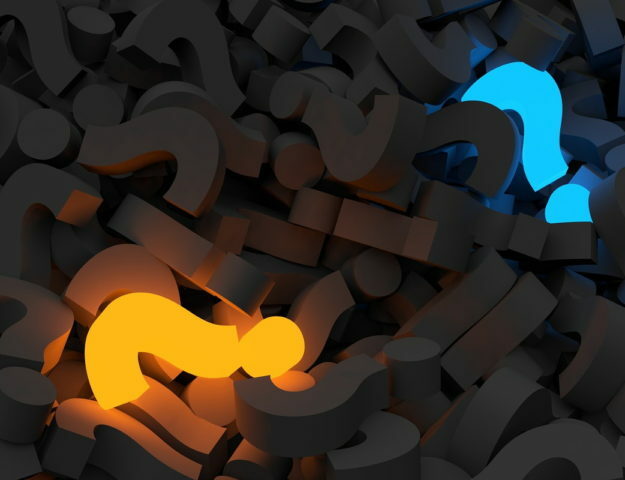 This means that developers, technical directors, and any other key decision makers can now know which version of the .NET Standard their chosen platform supports. This will allow them to make decisions based on the requirements of their problem domain. For instance, if .NET Core 1.0 is chosen as the target platform, then any version of the .NET Standard up to and including 1.6 can be used. However, if .NET Framework 4.6.1 is chosen, then any version of the .NET Standard up to and including 2.0 can be used. There is nothing stopping you from running the .NET Framework and .NET Core on the same server. So why not give it a go? 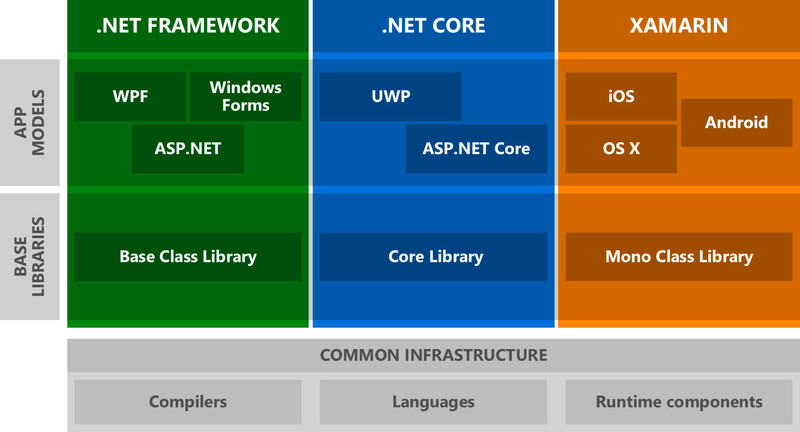 Since both the .NET Framework and .NET Core can exist on the same system in harmony (they are separate platforms, as far as each other are concerned), it is entirely possible to have multiple applications on the same system, but using different .NET platforms. This is great from a developer’s persepctive. Even if that developer is simply trialing .NET Core, it means that their .NET Framework applications wont be affected. Microsoft’s plan is for the .NET Standard is to replace PCLs, which should drive greater compatibility between the different supported operating system platforms. .NET Standard Library can be thought of as the next generation of Portable Class Libraries (PCL). The .NET Standard Library improves on the experience of creating portable libraries by curating a standard BCL and establishing greater uniformity across .NET runtimes as a result. 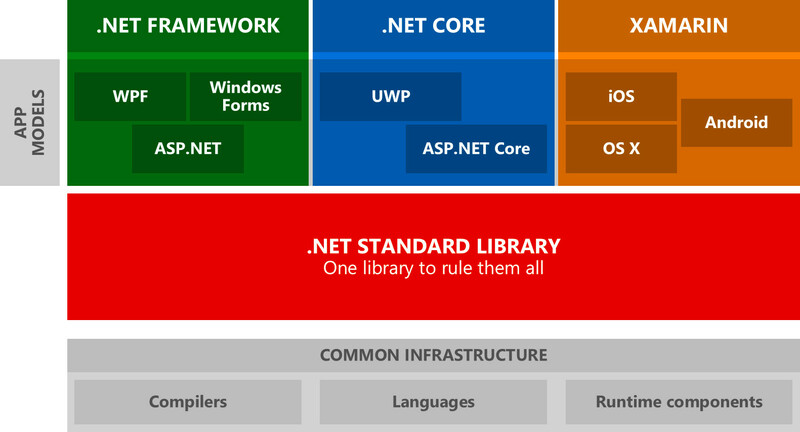 A library that targets the .NET Standard Library is a PCL or a “.NET Standard-based PCL”. Existing PCLs are “profile-based PCLs”. This means that your solutions will inform the .NET Runtime about which version of the .NET Standard they target. Since the .NET Standard provides a standard library, you will no longer have to worry about features being missing or not implemented by your target platform. As long as you check which features are available in the targetted NET Standard version. In .NET Core, this is done by adding the relevant lines to your project.json file. This is correct at the time of writing, as project.json is being dropped in future versions of .NET Core. 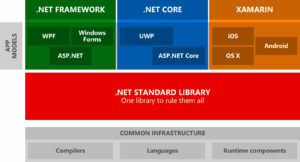 The NETStandard.Library is required to create portable libraries across all .NET runtime platforms. 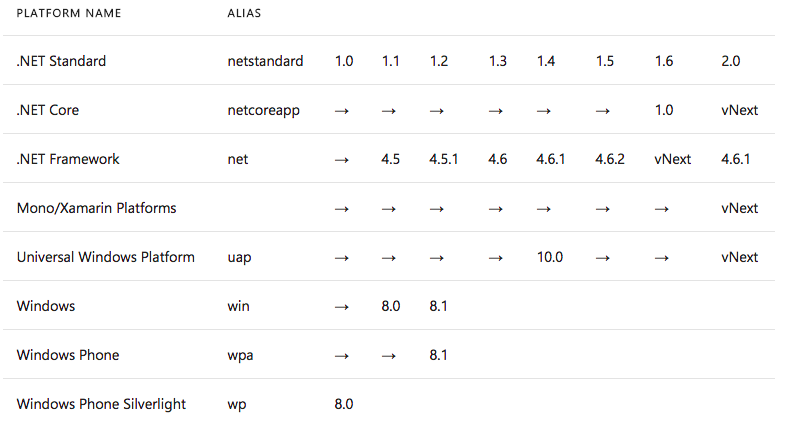 All of this means that as the .NET Standard moves forward, more platforms could be added to the .NET Standard. 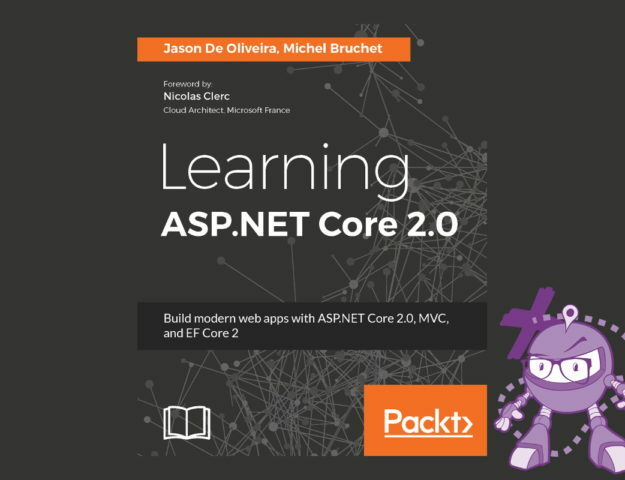 It also means that you will be able to target a given version of the standard and be safe in the knowledge that whether you use .NET Core, .NET Framework or Xamarin, you will have access to the same standard library.